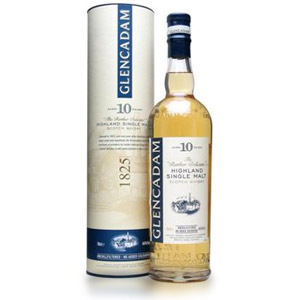 The blend contains just over 50% Lowland grain whisky aged in first-fill American oak barrels. The rest (just under half) is malt: around 7% from Speyside and the rest from two northern Highland distilleries. It’s aged in a combination of 10% first-fill sherry butts, 27.7% oak barrels fitted with new charred French oak ends (heads), and the rest in first-fill American (ex-bourbon) barrels. I love to see this kind of information made available by the whiskymaker – it shows that the whisky has nothing to hide, and acknowledges that people might be curious about the content of their whisky. Oh, and it’s $40. Appearance: Super pale – the color of hay. Nose: The grain is evident, but there’s a fresh, citrusy apricot note that wows. Dry hay, elderflower (really! ), and there might be a hint of dry mossy peat, but only a hint. Some vanilla bean, or vanilla ice cream. Custard. Soft, subtle malt, partially overshadowed by the sharper grain notes, but it works. Buttercream frosting. Mmm. Palate: Wow! Very creamy body. Creamsicle up front, with waves of vanilla pudding or tapioca, soft grain without undue alcohol burn, apricot preserves, marzipan… just wow. Confections unending, and all tied together with that nice, bright, citrusy grain. Just great. Finish: Medium length, a little more bitterness than I usually like, but it echoes with vanilla frosting and marzipan. On the very tail end, green apple skins. Overall: This is fantastic stuff for $40 a bottle. The grain lifts the blend up, rather than thinning it out or watering it down. There is a clear delineation between the prominent notes; nothing is muddied or vague. The subtle perfumy nose and creamy, flavorful palate make this an eye-opener. A few drops of water brings some green grass to the nose, and makes the grain sharper. 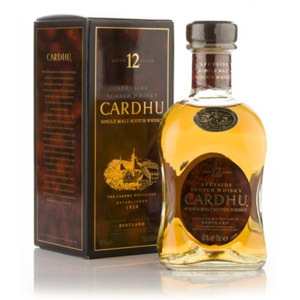 On the palate, it adds some smoke, revealing some meaty peat and charcoal. More wood tannins on the finish. I wouldn’t bother with the water, just let it open up in the glass for 10 minutes instead. You could, of course, use this for cocktails – but I like it straight up. It’s that good. I was a strict Single Malt man until shop owner said King Street was best Scotch he ever tasted. I agree with both him and your article. Thanks for the comment! 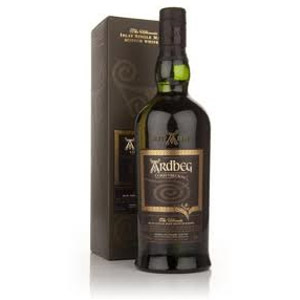 I wouldn’t necessarily say it’s the best Scotch ever, but it is definitely the best blended Scotch under $50, and that’s saying something, considering how many blends there are in the market, and how popular they all are. I realize everything is relative and subject to personal preference. But I definitely listen to more-learned tasters. Word of mouth is still the best advertising. Great tasting notes. I opened a bottle of Great King today. Really nice stuff. I paid $36 and find this to be a most enjoyable blend. I usually like to have a Fig Newton or two when I am drinking my old, sherried single malts but for this one Lemon O’s were in order…nice combo. I will be buying another bottle of this expression in the near future. Great find, thanks! 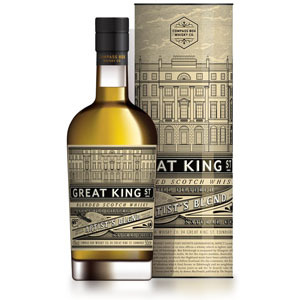 Sorry, I found Great King St. bland, undistinguished and quite harsh for a $40 scotch. Maybe just too subtle for me. Pales in comparison to JW Black, which is basically half the price. Interesting to contrast with the Peat Monster (by the same blender) which is anything but bland, though one-dimensional. Good with diet coke and a twist, as are most lesser, blended scotches. @Ben, Thanks for the comment! To each his own, of course. I personally think JW Black has an edge of paint thinner that puts me off entirely, even if it does have more peat (thus less subtle). To my taste buds, JW Black uses a lower quality of grain whisky (younger? more cheaply made? not sure) which puts it squarely in the same category as Famous Grouse, Chivas, and other similarly-priced blends. The reason I singled out Great King St., is that despite its subtlety (which I actually enjoy, some of my favorite whiskies are unpeated and “mild”) it lacks that vodka-esque character inherent in cheaply-produced blends with younger grain. It remains the only blended scotch that I keep on hand at all times in my cabinet. I agree with you Ben. I expected much more from this; the most interesting note I could detect was popcorn. Johnny Walker Black is much more interesting to me as well, much more complex and I don’t find the grain component to be too spirity either. The Talisker in it really lifts it up. 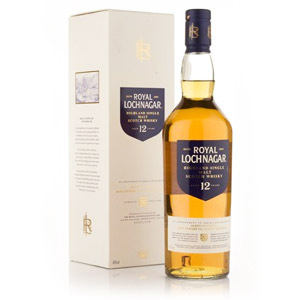 This blend needs something a bit more to help make it just a bit more complex, be that by adding in some Islay malt, or increasing the percent of sherry cask malts. Good stuff – excellent notes. I am sipping it in the highball format as I type and must say that it is a great blend. I find well-done grain whisk(e)y to be delicious, and this blend hits the mark in that regard. The grain component lends to it an aspect that reminds me of Redbreast Irish. I’m a fan of premium blends – still have a 1.75 litre of the discontinued J&B JET, and finished off a bottle of J&B Ultima. This one is right up there with the best of them. Looking forward to trying this tonight at my favorite new spot. Great King St is a wonderful blend. Really, really good. Really balanced and nary a harsh note, as others have said. It’s not the cheapest stuff out there, but I’m sorta hell-bent on finding a good blend (other than JWB). I have my everyday now (Teachers), but my special, regular weekend drink would be Artist’s Blend. I don’t know if I’m hallucinating, but I feel like I can tell when bottlers are using caramel coloring now (Scotch Noob is ruining me). It bugs me. Just be au natural, man. Artist’s Blend proves you don’t need that junk. Just bought 2 bottles here in Guelph,ON and can’t wait to open 1 up. Last of the batch now and thanks to this review. I just had this for the first time. Just based on the nose, I was wondering what all the fuss was about. Then I tasted it and got this explosion of wonderful flavors. It’s like several totally different sweet flavors at once. The finish was a little weak and disappointing, but it tasted so good I didn’t care. If someone said they only wanted to have one bottle of scotch in their house – period – I would tell them to buy this one without hesitation. It’s not the best I’ve ever had, but it’s definitely the best value. Incidentally, this stuff retails at my local liquor store for $31, which puts it at the same price as Johnnie Walker Black Label. Makes the choice between the two very easy indeed. At $31/750ml for CB Great King St Artist’s Blend, I’d buy at least 2, maybe 3 extra bottles. 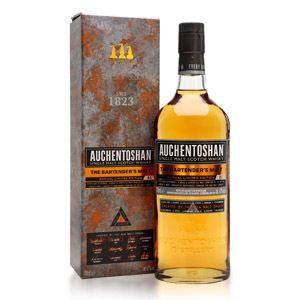 It’s great whisky at $37-40, & a steal at $31. Where did you get the $31 bottles? I’d like to get some at that price. Slainte. This is the best price I could find online: http://www.sunsetcorners.com/browse.cfm/compass-box-great-king-st/4,7437.html I’ve never purchased from this store before, though, and I don’t know if they ship outside of Florida. I am one of those horrible people that likes, maybe even prefers, blended Scotch. I know many are exquisite single malts, but frankly I find anything Islay undrinkable neat. Heresy, I know. I got a bottle of this, and liked it very much. Could use a touch more smoke, IMO. It had several surprises, apricot and a whiff of Cascade hops. But, to be entirely honest, I’m not sure I like it better than Ballantine’s Finest. That’s my daily whisky, and IMO much of what Great King Street has going for it is shared by that blend: the grain whisky in it tastes pretty good. They both succeed at everything they set out to achieve. Who among us can claim so much? I just tried the Artist Blend New York as well as Glasgow Blend. I found the New York a bit mild, but definitely worth its’ price tag. I found the Glasgow blend a bit more complex and deeper in flavor—preferable to the New York one. Was the New York one meant to be a mix for cocktails, while the Glasgow one to be drank neat? On a side note—I just got my hands on The General…has anyone tasted that? I bought a bottle today, tried it, and my taste buds fell in love. I can’t believe I have not tried it this until today. I mean I have been getting a little skeptical with single malt prices these days, so I decided on a blend. I went with this one, after reading your review of it. And wow, bang on review. Thank you. I will have to buy a few more bottles of this in the next few weeks. Bang on stuff. I opened my first bottle and had my first taste of this last night. I should mention, that like most of the whiskies I have purchased over the last year and a half, I did so based on your recommendation. Up to this whisky, your palate has rarely lead me astray. I’d wager to guess that 8 or 9 of 10 times, your advice has been excellent! Then I got to GKS Artist’s Blend last night. THIS is the crowning achievement of your whisky recommendations! Besides yourself, I can hardly find another whisky reviewer who has even given this whisky a spot in a blog post. For $40, this tastes to me like a combination of Hedonism and Redbreast 12 (minus the copper notes) with alittle fresh fruit thrown on top. Alright, enough fawning. In all seriousness, thank you again for this site, for your insights, information, and whisky advice. I am greatful. And this GKS Artist’s Blend is a phenomenal buy at $40. Thanks for the comment, Andrew, glad you enjoyed GKS! This review reads as an obvious advertisement.